David will captivate and enthrall your guests and family members during your wedding reception in Cambridge. Full planning will be provided for your party in Cambridge by David Fox: the world-class master of mystery and intrigue. 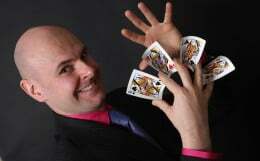 For corporate events in Cambridge, David is the first choice magician for all major companies. Searching for some sensational close-up magic, table magic and illusion in Cambridge? If you are seeking a magician in Cambridge, David Fox always makes a massive impression on every audience. Sensational magic, illusion, mind-reading and sleight-of-hand can all be yours - and more - at your next important occasion in Cambridge. 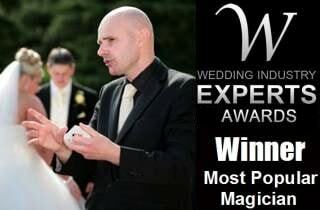 David Fox is one of the few world class professional magicians performing in the UK today and is ready to make your wedding, party or corporate function trip the sublime. Cambridge is of course world-renowned as a vital centre of learning and the arts. At a recent performance of magic at Wolfson College, Barton Road, David amazed everyone with deft displays of dexterity, mind-reading, illusions and entertaining prestidigitation. You can amaze all and sundry by hiring this mysterious man of mystery for your next important event around the Cambridgeshire area. See David's testimonials page for the wonderful feedback he has received for his magical displays on graduation days and at student awards evenings. David is also a proud supporter of the Royal British Legion and was invited to entertain celebrities at HRH Queen Elizabeth II's Diamond Jubilee celebrations in central London. A recent performance of card magic and gambling demonstrations at a James Bond themed night at a local Cambridgeshire barracks brought the house down and highlights how David Fox can fit in perfectly at any social situation or environment. Book this master of illusion today for your special event in Cambridge!